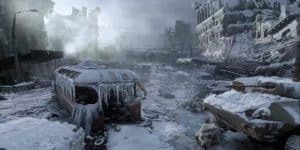 Metro Exodus Is A "Sandbox Survival" Game | Nerd Much? For those wondering exactly what that storyline entails, Bloch was kind enough to explain that too. Metro Exodus takes place after the good ending to Metro: Last Light. The main character Artyom returns and he must gather a group of other survivors to get on a train and escape Moscow once and for all. The game, as mentioned before, is to span an entire year. Thus, when you move from one area of the world to another, it changes seasons with new wildlife and everything. In addition, each new area will have “different societies [and] different ideologies” for the player to deal with. Especially when these characters change depending on what the player does in the game, and each will react to events differently. Metro Exodus is due in 2018 on the Xbox One and PC (thus far).